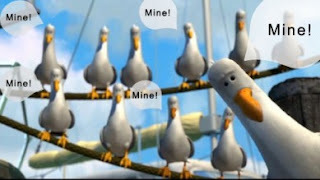 @GamerChick42: Sovereignty: Mine, Mine, Mine! What does it mean when a Faction War pilots says “I do not care about sovereignty.”? Most would take this to mean that the pilot doesn’t care about sovereignty mechanics. And, it would be partially true. FW pilots, in general, have an aversion to anything seen as relating to null-sec. Many of the ‘old-guard’ joined FW to get away from the structure bashing, blob mechanics, and cutthroat politics of null-sec, and become very agitated at the thought that those things could be incorporated into FW at any time. However, there is much more to Sovereignty than strictly mechanics. After all, do null-sec pilots attempt to gain sovereignty because they enjoy shooting structures? I believe that there are many reasons, but they all come down to one thing –Ownership. Whether it is power you seek, or control –whether you simply want to use and develop a system’s resources, or build a home—Ownership is foundational. However, the concept of Ownership is missing from Faction War at a fundamental level. Faction War pilots are locked out of Ownership within their Faction almost at every turn. They cannot control which alliances and corporations join. They cannot control who joins the NPC militia corporation. Because of this, most FW pilots do not identify with their Faction in the same way they identify with their alliance or corporation. Therefore, owning something as a faction does not mean the same thing as owning it with your corporation or alliance. But why would anyone fight over something when they can get it with their neutral alt no matter who owns the space? What risk is there when I can simply leave FW and temporarily avoid any station lock-out consequences? Why should I care about Warzone Control Tier, when I can put an alt into any winning militia and reap the LP benefits? I can get all the rewards, I can get all the benefits, and I can avoid the consequences no matter who owns what. Why should I care about Sovereignty? You shouldn't, Sov is the bane of the 0.0 game bringing only the bordom of the structure bash and the lash of the CTA and Strat op for the majority while the benefits are creamed off the top by the minority in power. This is why, I stated in the past that station lockouts were the wrong way to go, the faction bunker is where the faction pilots should be docking, and receiving the faction benefits. And no neutrals or opposing faction members should be able to access the bunker. If the opposing faction wants access to the bunker they should take it. People will always metagame. That's true no matter what region you're in. Alot of the changes coming down the pipe will hopefully shave alot of the worst offenses. And I have always endorsed docking rights to be a function of standing. I'm at war with Minmatar and would have horrible standing in they're systems. But certain pirates who also shoot at Minmatar should gain negative sec status until the point where they can't dock either. That's probably as good as you can hope for.